So, you probably thought the exploding thorn-covered trees were pretty deadly, or were put off by how the Eucalyptus is basically a fire demon reincarnated ironically into tree form. And a year ago I’d have agreed with you if you thought those were the worst trees in existence. But it gets worse. Oh, it gets so much worse. 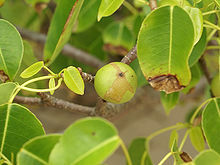 Allow me to introduce a tree known as the “little apple of death”: the Manchineel. Known to the Guinness World Records as “the most dangerous tree in the world”, The manchineel tree (Hippomane mancinella) can be found on coastal beaches and in brackish swamps where it grows among mangroves, and is filled with toxins. And when I say “toxins”, I don’t mean the kind that your local hippies try to cleanse from their system with the latest fad diet. I mean the kind that would murder them horribly and in graphic fashion. A flowering plant in the spurge family (Euphorbiaceae), it is native to tropical southern North America and northern South America, and is actually endangered. While most fruiting plants rely on animals to eat the fruit and spread their seeds, pretty much the only thing that can eat the death-apples of the manchineel without apparent harm is iguanas. Now you may think that’s pretty bad, but that if you just don’t eat the fruit, you’ll be alright. And if you’re thinking that, you have underestimated what I meant when I said “filled with toxins”. The sap acts as a strong contact allergen, which means that if you touch the sap you will break out into massive blisters. The sap has been known to damage paint on cars. It’s so bad, that the act of merely standing under this tree in a rainstorm will make your skin blister. This is the kind of stuff that it’s considered a war crime to use by humans, and the tree just makes it naturally. Natives would use the sap to poison the tips of their arrows – Juan Ponce de León died from manchineel poison on one such arrow. A particularly sadistic way to kill people would be to tie them to the tree and leave them for a week. Strangely enough, it is actually used for lumber in some cases, though the lumberjacks who cut it have to let it lay in the sun to dry, in order to remove the sap. Presumably while wearing full hazmat suits, but then that’s just my guess. While you can’t exactly chop it down haphazardly without it making you rue the day you were born, you also can’t burn it down easily, either. If the smoke from a fire with manchineel wood gets into your eyes, it can cause eye damage and potentially permanent blindness. Now picture what happens if you somehow magically got these to grow in a forest alongside eucalyptus trees. Or just on the beaches of a large island surrounding the eucalyptus forest interior. If there’s a gateway to Hell, that’s probably what the local wildlife is like. Basically, this tree is the incarnation of loathing and spite, and any dryad of such a tree probably sweats acid when it isn’t luring unknowing people to their doom with its pleasant-looking fruit or the shade of its leaves. Just imagine what a druid order based around the manchineel would be like. Ooh, or a monastery of poison-immune monks who use the manchineel for food and tree-shaping them into their buildings and living ships! Try pillaging THIS vessel, pirates! I now have enough spare time that I can actually (hopefully) write a few more blog posts! Also, they’re not gonna be as crazy frequent as they were when I started. I have a bad habit of getting overzealous, and so when I started this blog, I would try to post a full length blog post three times a week. That’s obviously not sustainable unless I do it for a living. Even then, it’s kinda ridiculous, I’ve learned. So, with that in mind, I’m going to try to continue the newer schedule of a single post every 1 or 2 weeks. No promises, I’m still human (despite the advances in modern biotechnology). In addition, I will be expanding what I talk about to be pretty much any nerdy thing that can be tied to biology in some way. That should give me a lot more to talk about, and screw it, it’s my blog anyway. TLDR: I’m giving this blog a shot again. Now that that’s out of the way, let us begin! IGOR, START THE LION KING INTRO SONG! Unfortunately, my normal work schedule will be picking up dramatically soon. This, combined with the pressure of sticking to a regular schedule of updates, and several other factors I won’t go into here, make me believe the best option at the moment is to put the blog on pause. I may make a few other updates as time goes on, but for now I will no longer be sticking with the regular update schedule, and will likely not be updating much at all for the foreseeable future. I hope you understand this, and in the meanwhile I shall leave my short list of posts up for anyone who wants to view them. I’ve gone over a tree that could take over an area before, when I talked about the Banyan tree. But today I thought I’d go over a specific famous individual that has the Banyan beat. So if you’re looking to add the Giant subtype to a Dryad for your game, or to have an Awakened tree really be a force to reckon with, or just want a different kind of World Tree, then look no further than Pando. Depending on how you measure, it is the single largest organism on the planet. Yes, every single tree in that picture is Pando. See, Pando is what is known as a clonal colony. 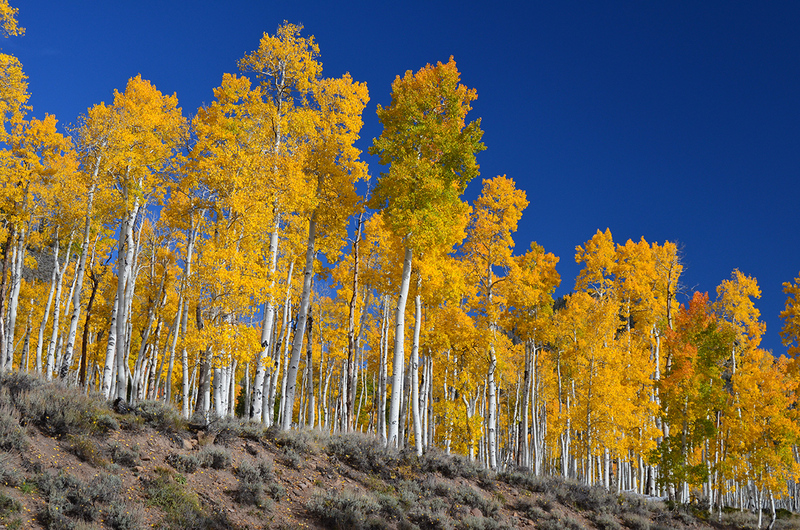 Basically, what this means for Pando is that each of those trees is connected underground in a single gigantic body that weighs an estimated 6,000,000 kilograms (6,600 short tons), covering 106 acres. What’s more, it’s also one of the world’s oldest living organisms, with that same root system being an estimated 80,000 years old. Each of the “trees” you see is one of over 40,000 stems, which each can die individually and regrow from the roots. Not bad for what was once a single Quaking Aspen. Imagine the fun you could have with this! A single tree that is also a forest and on top of that is literally older than all of human civilization, by several fold. What druid WOULDN’T want to learn from or protect it? Heck, the Awaken spell is more difficult to cast the more HD the target would have. At this point, it’d be beyond the capability of any one caster. It’s literally larger than Christopher Robin’s 100 acre wood. We’re talking full on “gather every druid from around the world/country together” ritual. Maybe that might not be enough. I’ll bet whoever decides to use a Speak With Plants spell winds up deafened after the first question. OR, maybe instead it’s simply been around so long and absorbed so much magic that it’s taken on a sentience of its own. And if that’s the case, can you imagine what perspective such a being might have? Of course, on a more ecological side, there’s still some pretty weird things that happen for Pando, even in real life. For instance, because it’s all the same organism, every tree in the forest that is Pando has its leaves change color and fall at the exact same time. Things that a normal forest has happen scattered throughout for individual trees happens all at once for Pando. However you choose to use the idea for your campaigns, don’t forget just how large it is. Really, it’s more of a setting for your game than a character. But maybe, with the right ideas and DM implementation, it could be both. 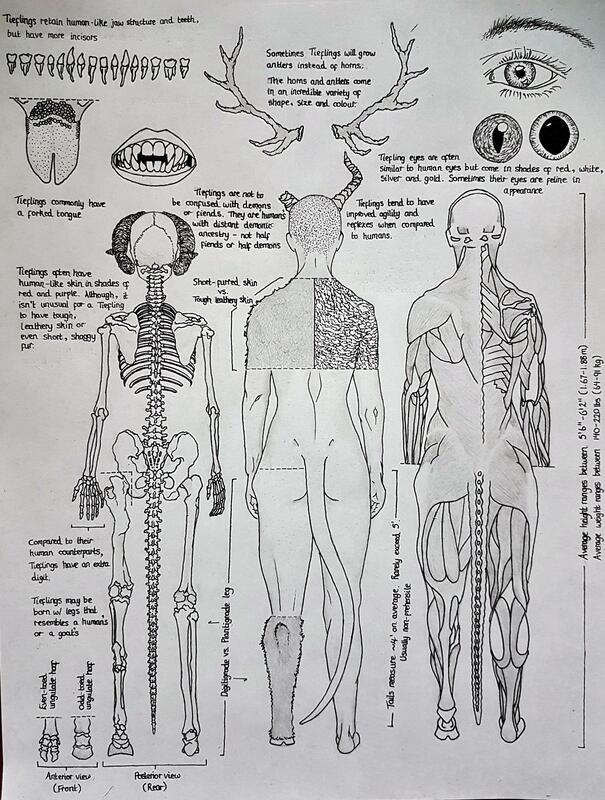 So I was browsing the web when I stumbled upon something I thought you guys would like: someone by the username of /u/Kahhunna on reddit has created (and kindly given me permission to post) a page detailing anatomy of a tiefling! Yup, you knew it was coming eventually. Biological zombies. Now, I’ll admit that I honestly am not that big a fan of the whole “infection” zombie, much preferring the more horror-esque zombies for my games. Necromancy, raising the dead, classic D&D zombies, though perhaps with a few interesting twists on how it relates to the soul. But that doesn’t mean you have to go full zombie with what I’m going to talk about. In fact, it may be even more horrifying if you don’t, instead just having everyone infected simply be… off, somehow. So, let’s talk about biological zombies. Turns out there’s several kinds. The first, which a lot of people are probably already aware of (and if not, strap yourself in, it’s gonna be a bumpy ride), is the one created by fungi. 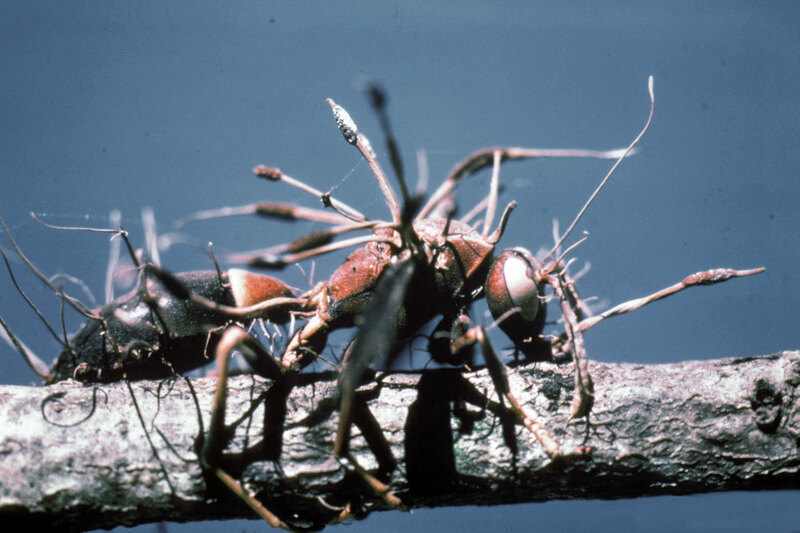 Cordyceps, to be specific. This spores of this fungal genus infect the specific species of insect or arthropod they evolved for, the mycelium invading the host and messing with their brain, and making their victims climb high up before gripping whatever structure their climbing on with a literal deathgrip. There, the fungus finishes slowly replacing host tissue, killing the host, and grows out of the body to spread its spores to other members of the species. It’s not the only form of life to brainwash another species as part of its reproductive cycle. There’s also the Jewel Wasp, which stings cockroaches in the brain, the venom working to eliminate their urge to escape. So the roach calmly continues to clean itself as the wasp bites off an antennae, and then idly lets the wasp lead it into a burrow the wasp made. The wasp lays a single egg on the roach, and then seals the burrow, Cask-of-Amontillado-style, with the living roach still inside. The roach just sits there, not a care in the world, while the egg hatches and burrows into it, slowly eating its organs (saving the vital organs for last, of course, so the roach stays alive as long as possible while it’s being eaten from inside). Eventually, having eaten the cockroach alive from the inside out, the new wasp digs its way out of the burrow to continue the cycle. These aren’t the only examples, either. There’s a protist called Toxoplasma Gondii that makes rats seek out cats rather than avoid them in order to get the rat eaten so the parasite can reproduce inside the cat. Make what conclusions you will about the fact that it has been also found in humans. However, if you plan on using these sorts of things in your campaign setting, there are a few things to keep in mind: for one, those sorts of parasites tend to be very specific, especially when it comes to the delicate workings of altering brain chemistry. Something that might make one species behave a certain way might make another species simply go crazy. For another, humans have very large and very complex brains, on top of being much larger than the typical targets of those brainwashing parasites in general. This means we would likely be more resistant to whatever venom they used, if not simply have it affect us in other unexpected ways even if we were pumped full of the stuff. Odds are, if something were to affect us in a reliable way that is useful to the parasite, it would probably be larger and/or target humans or humanoids specifically. So, if you want to introduce biological zombies to your local rpg campaign, without resorting to necromancy or otherwise using magic to raise the dead, maybe it’s time for your players to take a walk through a forbidden mushroom forest. Where they can find the overgrown remains of a town, and the stiff remains of the former villagers on the rooftops. Good luck on your Fortitude saves. Flying cities aside, we sometimes can’t help but imagine a world up there. The only problem is that, unlike what lies over the horizon or below the deepest depths of the sea, we can plainly see that there isn’t anything but clouds or the occasional bird in the sky, which makes it difficult to picture something very vibrant living there that isn’t huge and easy to spot. Like said flying cities. Instead, there’s not as much a sense of discovery when you can see everything from miles away before you even get the ability to fly. But I think it’s possible to do full adventures through the Wide Blue Yonder. Even without everything being obvious. What if it’s not a street between you, but a couple thousand feet or so? How large would something have to be before you could even see it, let alone how often would someone look up to do so? Turns out there’s whole swarms of life directly above our heads that most people don’t even know about. And if larger versions of that life were camouflaged to better hide in the sky, it’d still be pretty hard to spot. So, how would such things be camouflaged when there’s literally nowhere to hide? Just take a page from what lives in the wide expanse of the sea, away from any solid land or seabed: life is sparse, but present, and hiding from predators (or prey) that sweep below to look for images blocking the light becomes pretty important. Many creatures develop either clear bodies, letting light pass through them, or they develop bioluminescence on their underside to disguise against the light from above. Failing that, they tend to have other defenses, or hide around the few floating structures available to them. In the sea, it’d be floating seaweed. In the sky, it’d be clouds. Which, reminder, don’t look nearly as solid up close as they do from afar. They’re flying fog banks. Keeping those aspects in mind, what sorts of Beastiary monsters would be able to be easily reskinned for such an adventure? I suggest, for starters and aside from the obvious Silver Dragon, that you keep your mind flexible. It’s already so clear that people can walk right into it, let alone spot it from a few hundred or thousand feet away. Simply change the gelatin aspect for one of fog, give it a slow fly speed, and have it live in the clouds. Maybe that’s where acid rain comes from in your world. And knowing that any cloud could hide something that wants to eat you would definitely make things interesting for your players. Especially if they have something else looking for them, and have to choose between being exposed or not. That takes a scene of beauty and turns it into a very interesting dynamic. Treat it like a desert or the ocean: key locations separated by many miles of wilderness, with the possibility of some very interesting forms of life showing up before you even realize it. You may be able to see very far, but the directions you gotta look in to be able to spot a predator just got multiplied greatly. And the wind likely covers any sounds of their approach. Hopefully that makes your sky pirate campaign through the elemental plane of air an interesting one. Or just a fun new way to mess with the wizard in your D&D group who learned Fly. Organic technology tends to not be very well fleshed out (pun intended) when it shows up. Usually you wind up with the equivalent of the Womb Level from video games, but for your scifi rpg. Whales in space, and all. So I figured I’d give my own take on what a living spaceship would look like. Allow me to introduce to you the concept of Dyson Trees. 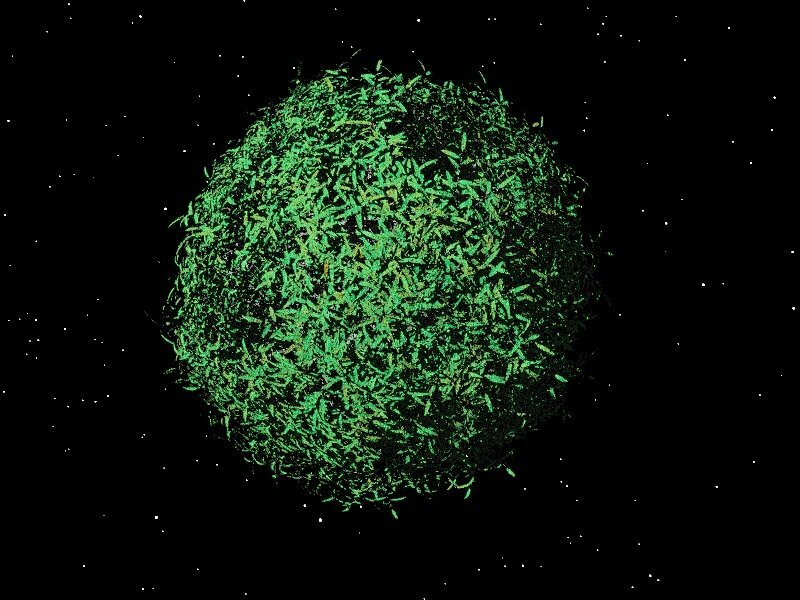 Dyson Trees aren’t like Dyson Spheres, which encapsulate an entire star in order to gather 100% of its energy, but rather simply are the concept of genetically-engineered plants that could grow on a comet, using the comet and ice for the water and raw materials. I mention them because it brings to the front an important point. A living ship doesn’t need to move much, aside from the engines. And like most non-living spaceships nowadays, it would need a source of fuel, the most readily available one being the sun. Leaving the exact method of propulsion out (since that’s one thing that scifi writers really seem to enjoy changing around anyway), a ship is for the most part a solid structure filled with pipes, wires, and the largest moving parts aside from the engines are usually just the doors. As opposed to an animal, which is always in motion in one sense or another, even cycling blood through the body. Given the need to harness energy, the most efficient available source being the sun, and a general lack of movement (especially since movement burns energy anyway) aside from the often-differentiated engines, plants seem the obvious choice for a living spaceship. They pipe fluids similar to animals but with less energy spent doing so, moving water from ground level to the tops of the tallest trees. They naturally absorb sunlight, and could be genetically engineered to absorb even more of the spectrum than most currently do, like the fungi who absorb radiation in Chernobyl. The doors and other necessary parts may be animal-like if need be, but plants have also been shown to be capable of movement through such examples as the Venus Fly Trap. Sure, the plants usually need more time to reset after each movement, but they could just be set for any emergency airtight seals. The rest could be just normal doors. No need to overcomplicate things. With the animals living onboard (i.e. humans, and possibly pets) you could have the ship and its passengers literally form a mini-ecosystem, with the waste from one being able to be put to use by the other. However, that’s not to say there can’t be any animal-based parts at all. If you’re building a living ship, you should have the technology required to manipulate cells to an incredible level already, and should logically thus be able to blend different aspects across kingdoms of life to suit your needs. So a tree with a central nervous system isn’t entirely out of the question. Or some symbiotic relationship between a custom-made plant and animal, each fulfilling basic functions within the ship as a whole. Not as tough or reliable as nonliving technology. This objection counters the “self-repairing” aspect of living systems by pointing out that they’d be repairing damage nonliving systems likely wouldn’t have taken in the first place. But that seems to ignore that there ARE living systems that don’t take as much damage as most others. Ever try and shoot a 9 mil at a charging elephant? Not to mention that the non-organic technology touted is usually already incredibly engineered. Steel is the result of literal millenia of smelting technology, and it was sought out for toughness and resistance to damage. Considering that there are forms of life that already incorporate small amounts of metal into their systems, it’s not too crazy to assume that a millenia or two of organic tech development would be able to create some form of metallic wood or shell. Not to mention that there are already forms of life that can survive extremes quite easily, known as extremophiles. A living ship can get sick. In theory, yes, but a nonliving ship can catch a virus as well, and like the living ship both forms of infection usually have to be created with the specific object of attack in mind. That’s why generations of people could hang around livestock without catching disease from them, our microscopic friends are usually extremely species-specific. And if you’re using a plant, that becomes even more magnified. Any civilization capable of genetically engineering a lifeform to the extent that it can comfortably carry itself and others into and through outerspace, would be capable of engineering a sufficient version of the oldest form of antivirus: the immune system. Not to mention that we can regularly give our own immune system “updates” in the form of vaccines. For something to be able to affect a system that was engineered to that extent, it would have to be engineered itself. Vulnerable to mutagens, toxin, and most of all, old age. Not to mention that there are plenty of complex organisms that don’t seem to age at all beyond maturity. Once you understand those, it’d be simple to implement them in both the ship and those who rode within it. But that’s for another day’s post. You can’t just store living technology. It has to be continually cared for. Toads regularly freeze themselves to survive winter. Tardigrades can dry themselves out and basically go dormant. There are plants that have been revived from 32,000 year old seeds. Sure, most living things need to be continually cared for, but most living things aren’t built to be able to store themselves. For those that are, it’s clearly not out of the question. Okay, okay, I’ll stop the rant. But my point is, if you’re going to make a living ship, feel free to think it out. After all, that’s part of the fun! The starter pokemon of the fantasy genre. Ever get tired of seeing the same basic races over and over and over again, with just a few different interpretations? Why is it that science fiction seems to have so many creative new intelligent species for nearly every work, while fantasy seems to just go with the same standard ones? Perhaps a better question is, what do they actually add to the experience? Odds are, not too much that a group of humans with similar culture wouldn’t already add. We’ve seen them around enough that your players barely bat an eye at the idea, fantasy cities usually brimming with a whole host of cliche races (gnomes, half-elves, the typical “standard races” from D&D with maybe a few kobolds thrown in to seem “exotic”). As if the dating pool wasn’t difficult enough, imagine having whole segments of the population you were literally biologically incapable of having a family with. Even humans, with so many half-breeds, push it when you start including dwarves, halflings, etc. Some people might consider that a plus, but as far as species survival goes, it doesn’t help matters. And if you have something as crazy as the Star Wars Cantina scenes, it’s a wonder any species aside from the more numerous humans manages to maintain the population at all outside their homeworld. If none of these extra PC races are actually adding anything that other humans couldn’t, then they’re probably ultimately taking away from the novelty of other things in the world, like unique monsters. The players get used to everything being different for the sake of different. Establish a pattern or reinforce an existing one. Reveal an exception to it. You need a pattern before you can have an exception to it, and if your pattern is “different for the sake of different”, then simply having something be a different species isn’t going to really grab the player’s attention unless the specific species has some kind of known backstory you’re taking advantage of. If you simply make the Orcs, Elves, and Dwarves just different groups of humans, likely not even needing to change too many racial modifiers/abilities to do so, you open up the possibility of having a lot more wonder in your games when your players finally come across something that doesn’t belong. Or, you could go the other route. Players wind up being used to the standard races, so you could instead simply get rid of the standard races and go for the truly exotic right out of the box. Things the players haven’t really seen much of before, if they’ve ever seen them at all. New races, like so many JRPGs like to create. Something unusual, that your players will enjoy learning about and maybe even enjoy playing themselves. You have the power to make your setting be just about anything you like, right? Don’t be afraid to take advantage of it, and bring about something truly new. Don’t just have Elves, Dwarves, and Orcs, “just because it’s fantasy”. Let your imagination run wild, after all!